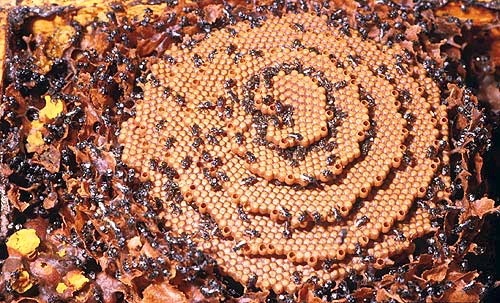 ‘Sugarbag bees’ are the common name for Australia’s native and social stingless bees, which home themselves in hollow logs and produce these amazing hexagonal spiral combs to rear their baby bees in. 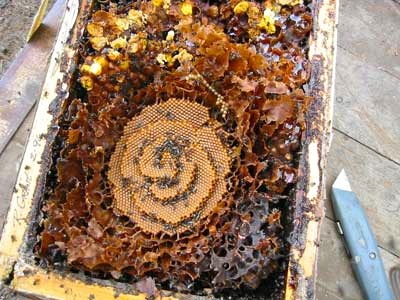 Inside the hive, there’s two main aspects of how the colony is set up – there’s the central spiral comb where the brood is housed, and the surrounding ‘sugarbag’ which is a complex arrangement of conjoined small resin pots, that the bees manufacture to hold their stores of honey and pollen. Australia’s social stingless bees just got re-named recently, but I doubt this ancient and exquisite species noticed much. 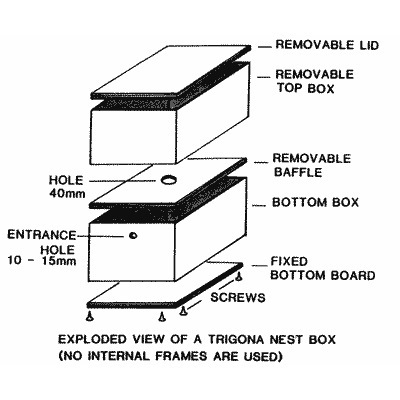 What was Trigona, is now Tetragonula. The bees remain the same. Australia has over 1,500 species of native bee, but most of them are solitary, meaning they don’t live in a colony with others. Tetragonula are the main exception to this, and create hives in hollow branches to house their young. Up until the 1980s, Tetragonula was just another insect/bee thing to most Australians, until it became apparent that they were crucial for ensuring good pollination rates for some crops. And like many of our native species, the clearing of older trees with hollows in them was affecting their numbers. 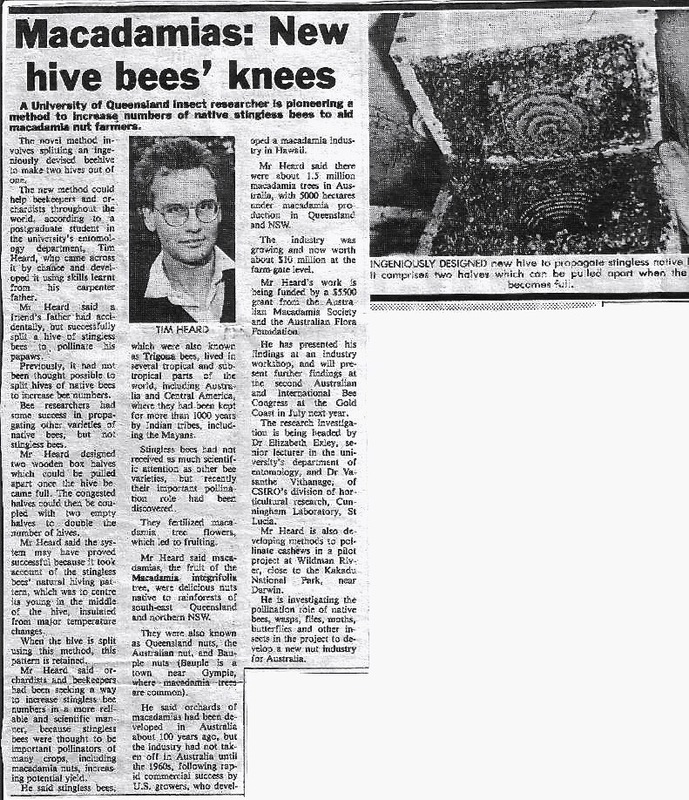 It was around this time that Tim Heard, an entomologist with the CSIRO, started figuring out a hive box model that these bees could live happily in, which was easily transportable, and most importantly could be ‘split’ to increase hive numbers. 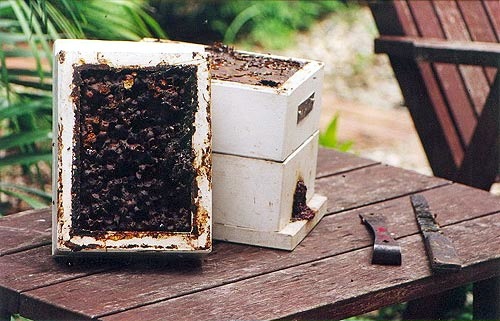 These days Tetragonula box hives are used widely for crop pollination purposes. They’re also used widely by regular gardeners who install just the one box to increase garden pollination, and aid general garden diversity. 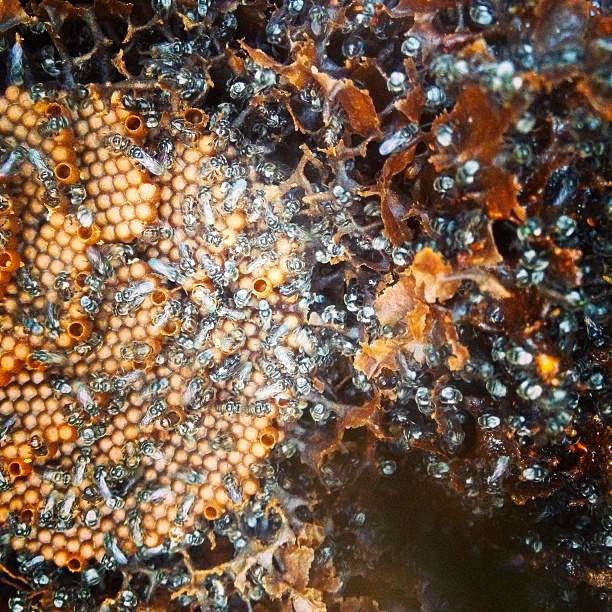 Depending on where in Australia you are, you can sometimes harvest some of the sugarbag from the top part of the hive by pricking holes in the honeypots and standing the box over a tray to drain out the honey within. Tetragonula’s range extends down past Sydney on the east coast, but you’d be lucky to get anything like a ‘honey harvest’ below Brisbane. This is because (a bit like european honeybees) in most climates the colony needs significant honey and pollen stores to see out the winter, when its too cold for them to forage. So you might be in for a taste, but not a jar of this particular honey come hive checking or splitting time . Which doesn’t make these bees any less wonderful, just different. 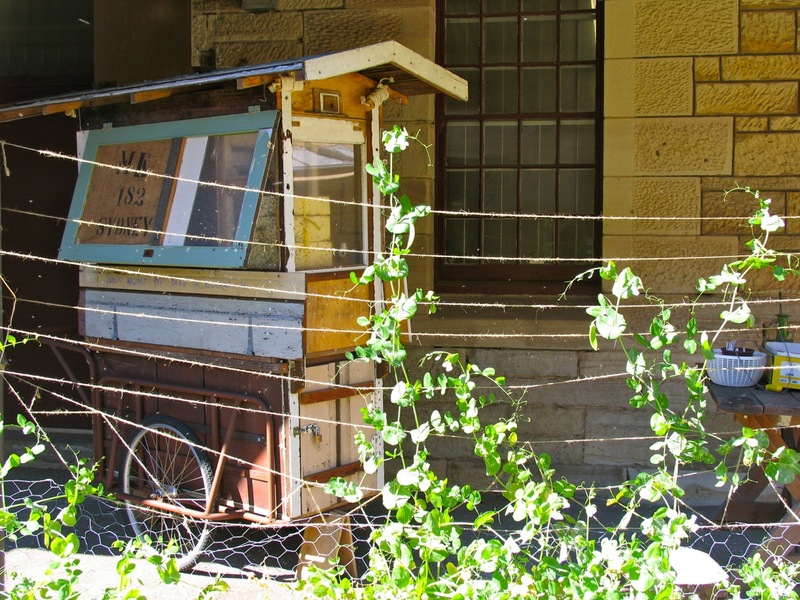 To tell you the truth, I just really like the idea that, sitting in the garden out front of the community center where we run our Sydney courses, there is a small box containing thousands of amazing creatures who live together in a spiral comb, surrounded by honey. And who fly out each day to pollinate and gather in the garden and beyond. How good is that? Who wouldn’t want that in their garden? For those of us on the west of the great divide, though, it’s not an option. Tetragonula have their natural range, and it don’t extend to Mudgee! It’s too cold. Oh well. We can grow great stoned fruit without masses of fruit fly. There’s upsides to everything. 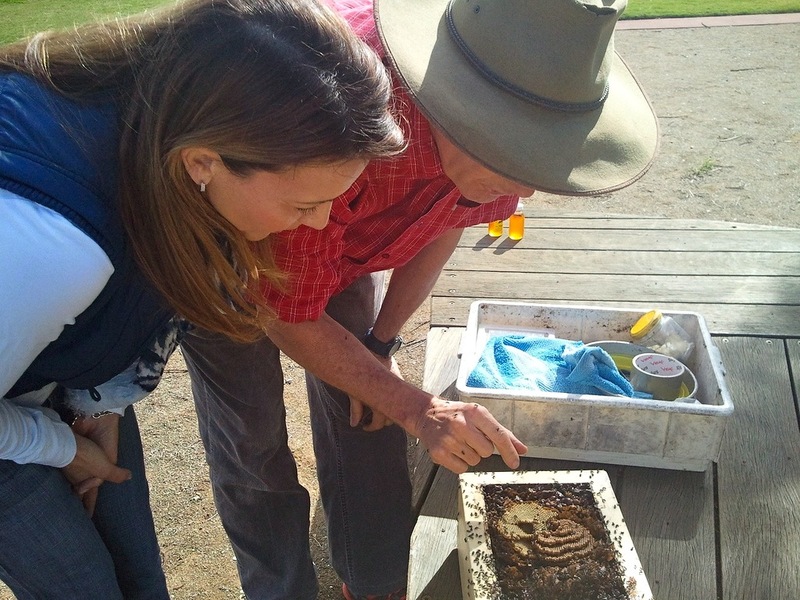 We’re running these in order to facilitate a super expert who also happens to be a lovely guy to teach us all the details of stingless bees and their beekeeping, as well as the history and wider story of stingless bees in Australia. I’m looking forward to learning lots more about these little quiet achievers, their rather incredible hives, and how they fit into our ecosystems to ensure diversity and abundance. If you're a Natural Beekeeper, then beeswax is part of your har . .
Our bees are back! We've set up a small Warré apiary at Buena V . .
Have you seen the latest edition of Organic Gardener Magazine? It . . This is so cool! What a beautiful comb they make! I have yet to explore the world of beekeeping, but I do know enough to respect and protect the bee. Thanks for the info, and amazing photos! Really magnificent to see, thanks for sharing. 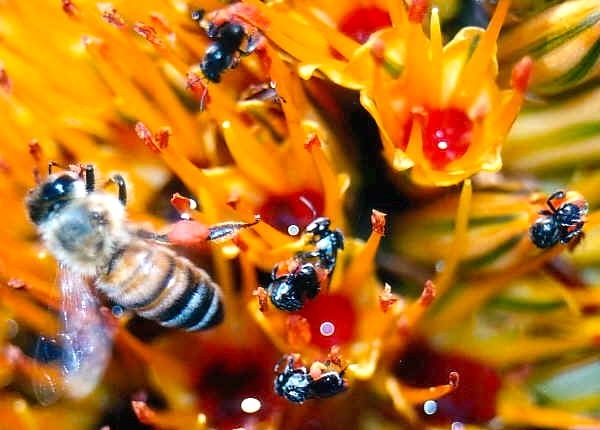 So exciting that native bees are moving into the consciousness of more people! Yay! Thanks Milkwood for helping spread the word, they are just great and Tim is the bee whisperer! I knew Tim through work many years ago. His knowledge of and passion for sugarbag bees is remarkable. If Hobart wasn’t so far away (and out of their range) I’d be coming along. Fascinating. I never knew stingless bees existed! Great photos. Very easy pets these ones. Peaceful to watch on a sunny winters morning. These are so interesting. We really want to get a hive or two going in the next year or two on our farm! Question.. why are my stingless bees gathered out side at nite at about 18 degrees. We have been keeping Tetragonula carbonaria in Zabel’s modified version of the OATH hive with a honey super on the outskirts of Sydney. We collected 400gms of sugarbag honey from our single hive this season leaving more than half of the honey pots for the bees. I expect when we are more confident we’ll be able to collect double that. Given the right microclimate collecting honey as far south as Sydney is possible. A little bee was buzzing around me this morning. Then I saw a few more and later I found one trapped in a spider web. Using a piece of bark, I removed the little bee (about 5mm long, wings longer than the body, brown to black with sides of body light brown). I could feel the piece of bark vibrating in my hand. I removed the cobweb with a piece of grass and away the bee flew. I live in Hillwood on the East Tamar north of Launceston, Tasmania. Any clues as to what kind of bee this is? I looked up Aussie Bees website but there was not a photo of this bee.